Pumpkin continues to be on the Nutrition Mechanic food brain. And because I’ve been experimenting with some of the packaged pancake mixes AND today is Halloween, what better time to share an easy, tasty, pumpkin flapjack recipe? The Birch Benders Colorado-based company has a number of pancake mixes, available in gluten-full and gluten-free varieties that you can simply add water to and griddle up. While they do have new pumpkin spice mixes on the market that contain dried pumpkin, I used the basic Paleo gluten-free mix and added canned pumpkin and spice, along with other goodies for a nutritional upgrade. 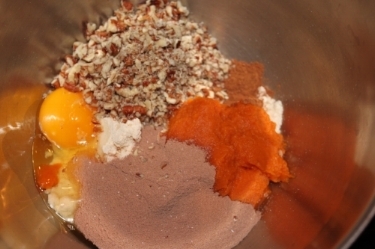 Mix all ingredients in a large bowl and let sit for a few minutes to thicken. If you like less dense pancakes, you can add more liquid (start with a few tablespoons, mix and see how it “feels” in consistency). Get your griddle pan going on medium heat. You can opt to lightly oil the pan with a coconut oil or olive oil. Use a large spoon (or small ladle) to get the batter onto the pan and your flapjacks griddlin’ up! Flip once you see the edges firming up. You may also want to press down the cake with your spatula to flatten it for more even cooking. Taste-wise: well, Yes to Yum. But you need to like the flavor of pumpkin. *The nutrition information was updated after this blog was published due to a clarification I needed from the Birch Benders company. I like my flapjacks “well done” with a slight crisp! I topped one of these with almond butter, folded over into a mouthwatering sandwich. The next day, I fried a couple eggs and use a pancake to make a sandwich. Perhaps odd-sounding, but I enjoyed the flavor hits. 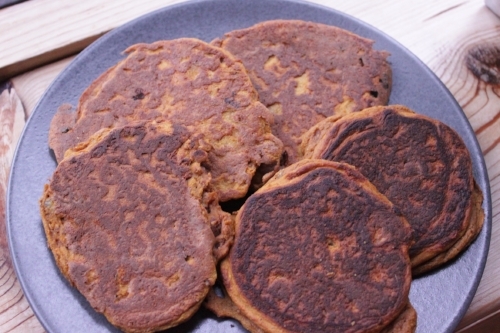 Bonus tip: Make an extra batch of pancakes to store in the freezer. When you’re ready for them later, pop in the toaster to reheat. If you give these a whirl, post your pic and tag me on Instagram, my fellow pumpkin lovers!